New Tootsie Roll Assortment Of Banks You Can Trust! 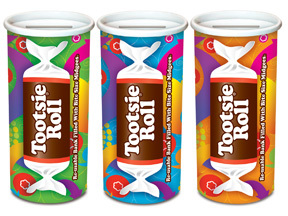 Chicago, IL - Tootsie Roll Industries is pleased to introduce a new Tootsie Roll Bank shipper display that gives candy aficionados three great choices: Vanilla Midgee Banks, Tootsie Fruit Roll Banks, and Classic Tootsie Roll Midgee Banks Each 4 ounce reusable bank provides lasting enjoyment. The banks are kosher, nut, egg and gluten-free.